As mentioned in an earlier post, I was honoured be invited to join a select few guests at a lunch to celebrate the launch of the Maids Head Hotel’s spring menu in its WinePress Restaurant. This came about because the Maids Head has, to its credit, become a GOLD sponsor of the Norfolk Food and Drink Festival – so I was there in my volunteer role as a champion of the festival and local food and drink producers. The lunch took place on Friday 4 April – and it was, quite simply, delicious. Now I admit I don’t often eat out in restaurants (normally only on holidays) – and my idea of fine dining is a good ‘gastro pub’ lunch – so I can’t really compare the experience with any other establishments in Norfolk. However, this was definitely the kind of food I would hope to get if I booked somewhere for a special occasion. The focus of the meal was very much local food and drink. The wines were from WinBirri, which has vineyards in Surlingham, the crab was from Cromer and the lamb was from Thetford. Unfortunately I was driving (the price of living in a rural area) so could only try a few sips of the wine. This was perhaps a good thing since I don’t have much of a head for alcohol, particularly at lunchtime, and the two I tried were very tempting: a crisp, toasty, sparkling white and a refreshingly dry rosé that reminded me of summer berries. The meal started with canapés served on delicate china ladles – a bit like the soup spoons you used to get in smart Chinese restaurants (when I was young) – this made them particularly easy to hold and eat. Now I love canapés – done well they provide the perfect combination of taste and texture in a single hit. Many years ago, during the dotcom boom of the last century, I went to a party at the Natural History Museum, where we were served the most delightful canapés made by Anton Mosimann’s catering company – well, I’m pleased to say, Head Chef Magic’s canapés are easily as good. My favourite was the crispy quail egg with beetroot and mooli (which is apparently a white radish – news to me) – the crispy coating contrasted beautifully with the eggs, which were still soft in the middle, while the slivers of vegetable added an extra light crunch without overpowering the other flavours. There were three other canapés to try: a tip of grilled Norfolk asparagus in a little shot glass with hollandaise sauce, oak smoked Norfolk chicken & chorizo terrine (a mouth watering combination of gentle smokiness and spiciness), and a tian (which I think means layers) of fresh Cromer crab and delicately fragrant basmati rice. We then sat down for the main course: naturally I ordered the lamb, although there was a very good looking vegetarian dish of roasted Portobello mushroom, crispy herb polenta, mozzarella fritters, sun dried tomato pesto and mixed leaf salad. As you can imagine, it tasted wonderful according to those who tried it – and once again demonstrated Head Chef Magic’s passion for combining fresh flavours and contrasting textures. There were also lovely fresh baked bread rolls to eat during the brief pause before the main course was served – all made on the premises using Magic’s own live starter. My main course contrasted two cuts of lamb: slices of roasted rump, beautifully caramelised on the outside while still being delicately pink on the inside, and a spoonful of pulled, slow braised shoulder rich with the scent of rosemary. This was served on a fabulous disc-shaped ‘tian’ of sliced rosemary and garlic potatoes – soft in the middle and crispy on the outside, surrounded by glazed baby onions and salsify (a type of root vegetable – again, news to me), crispy pieces of smoked bacon, fresh peas and rosemary jus. All in all it was excellent – full of wonderful flavours but perfectly balanced. Now I have to confess I don’t have much of a sweet tooth – for some reason my taste buds have changed over the years and where in the past I would have craved something sweet and sticky, I now find myself hankering after a square of bitter chocolate and a double espresso. So I probably can’t do the final dish justice – save to say it looked stunning and if you like rhubarb then you will love it. Called ‘Textures of Rhubarb,’ it had nine exquisite creations all flavoured with rhubarb, including marshmallow, mini crumble (in a biscuit case), refreshing sorbet (which retained that lovely tart rhubarb taste), parfait with crystallised ginger, purée, ginger gel, rhubarb sherbet, jelly and rhubarb crisps. A good meal is always welcome but it lacks a certain something if it isn’t served in good company – thankfully the Maids Head had catered for that too. While the canapés were being served, I had the pleasure of meeting Keith Driver the Lord Mayor of Norwich, who has served his community for many years; Graham Creelman the Sheriff of Norwich, who was once the managing director of Anglia Television; and Melanie Cook from the Visit Norwich team. I also caught up with the organisers of the lunch: Christine Malcolm (General Manager at the Maids Head), and Deborah Cubbins (Marketing Manager), as well as Paul Dickson, a PR guru and local historian (who gave a short but fascinating talk about the hotel at the end of the meal). And I chatted, all too briefly, with the delightful Sarah de Chair, who heads the Norfolk Food and Drink Festival committee and is the person I have to thank for asking me to champion the festival – and consequently for my invitation to this event. 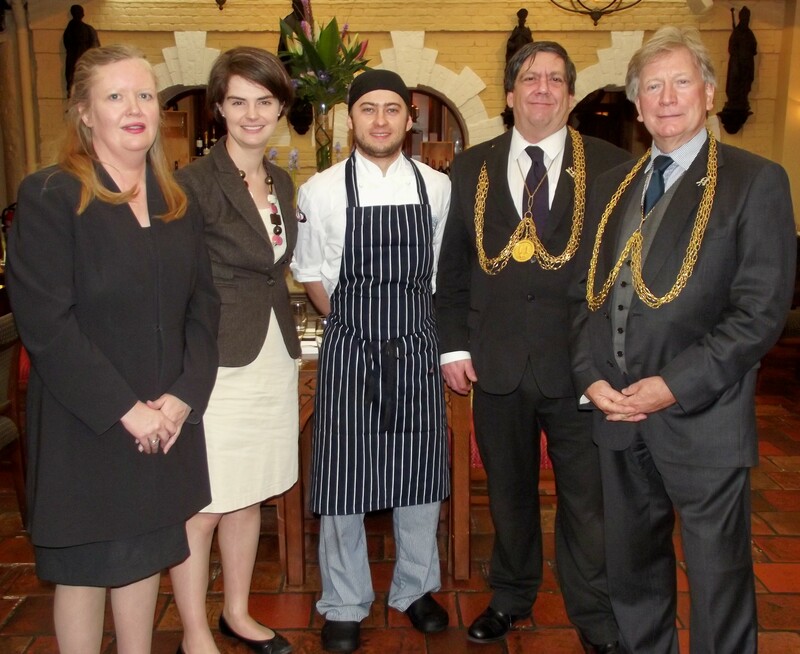 L to R: Christine Malcolm, General Manager; Chloe Smith MP, Norwich North; Marcin Pomierny, Head Chef; Keith Driver, Lord Mayor of Norwich; Graham Creelman, Sheriff of Norwich. Then, when we sat down for the main course, I found I had the honour of sitting between Caroline Jarrold (who, if you don’t know, does a huge amount for good causes in the city and county) and Chloe Smith, the MP for North Norwich (who, putting politics aside, seems genuinely committed to working for her constituency and helping young people into work). Both women were great company, chatting knowledgeably on a range of topics so the conversation flowed pretty effortlessly. At the end of the meal I had the opportunity to meet our charming host and the owner of the Maids Head, David Chaplin, who has great ambitions for this grand city institution. He is committed not only to using local suppliers for food and drink but also to refurbishing the hotel and restoring its former elegance, without making it feel too formal. This means striking a careful balance between preserving the historic fabric of the building, which makes it so special, and bringing the furnishings and decor up to date, so as to create a comfortable yet contemporary feel. Having met David and his team, I am confident the Maids Head is in good hands and destined to once more be the pride of Norwich. Finally, thank you to all the team at the Maids Head for such an excellent experience, particularly Head Chef Magic and Taya Hornsby, Food and Drinks Manager, and her colleague Katherine for making our visit so pleasurable. I think it is safe to say that being a volunteer champion for #NFDF2014 will very rarely involve such luxurious events – so I hope you will forgive me for making the most of this one. Next week I plan to visit The Genome Analysis Centre, the John Innes Centre and the Institute of Food Research at the Norwich Research Park to find out more about the science of crop development. Then over the next few months or so (day job permitting) I hope to visit a local abattoir to talk about the provenance of our food (particularly relevant after the horse meat scandal) and an engineering company that makes award-winning agricultural machinery right here in Norfolk. If you have any questions or comments, or ideas for future posts, please feel free to post them under this blog or tweet them to me. I will do my best to reply. I hope you continue to enjoy these posts about the Norfolk Food and Drink Festival 2014 (see my earlier post about being an #NFDF2014 Champion) – and other food and drink events around the county. This entry was posted in #NFDF2014, #VisitNorfolk, #VisitNorwich, Culture, Local Drink, Local Food, Norfolk and Norwich and tagged #NFDF2014, #VisitNorfolk, #VisitNorwich, Drink, Food, Norfolk, Norwich by Huw Sayer - Business Writer. Bookmark the permalink.